"This whole roasted chicken turns out terrifically flavorful and tender, and the broth left in the bottom is a perfect gravy in itself!" Cover the dish with aluminum foil, and bake in the preheated oven for 20 minutes. Uncover and baste the chicken with the pan juices. Continue cooking until the chicken is no longer pink, or until a meat thermometer inserted into the thickest part of the thigh reads 165 degrees F (74 degrees C), 1 to 2 hours. Baste the chicken every 10 to 15 minutes after you uncover it. 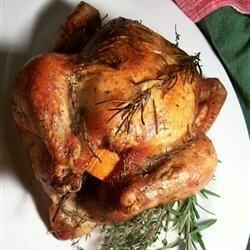 Once cooked, allow the chicken to rest out of the oven for 10 minutes before slicing. Lots of effort for an OK result. The chicken was moist but rather bland. If I make again, will add spices and salt. Even better if you cook the chicken upside down until 20 mins before then end of cooking time (approx). Well I made some changes such as: 1.I just used parsley 2.olive oil in spite of butter 3.add potato with skin in the pan It was marvelous and my friends loved it! This did not have the orange flavor that I was looking for, but it was very tender and eveyone seemed to enjoy the chicken.